The great name you've known as Aspex, is now referred to as Easyclip; quality and ingenuity you've come to expect from the leader in twistable, bendable eyewear. Aspex Eyewear presents MagneTwist, the next generation in twistable, elastic frame and magnetic clip-on technology. The frames are made of Aspex's patented trilaston, a fusion of aluminum, beryllium and copper. Additionally, MagneTwist utilizes rare earth neodium magnets (10 times stronger than ordinary ferrous magnets) in its clip-on; a patented top-mount design, which works with gravity to hold the lens securely in place. Aspex prides itself in being a technology-based company that brings the latest technological breakthroughs to you. 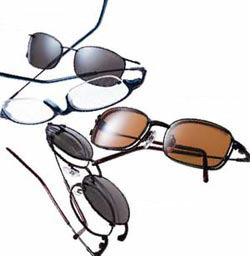 The MagneTwist collection represents the most recent scientific breakthrough in elastic frame technology and magnetic clip-on design, offering consumers the benefits and comforts of both technologies. Frame shapes range from traditional to trendy geometric styles. Trilaston, which has a momocrystalline structure giving it excellent resistance to shock, corrosion and extreme temperature variation, is now also used exclusively in its EasyTwist collection.